As a compliment or alternative* to not refunding cancelled stars, it'd be nice if chat would auto-raise a flag identifying someone starring n items in x minutes, or at least provide a list of unusually active starrers that could be consulted when there was a problem. While star-spam is fairly low on the totem pole of malicious abuse, it's obnoxious enough that giving moderators some ability to identify problem users so they could be suspended from chat would be a welcome change. This of course assumes that users suspended from chat cannot star things, which I'm not positive of. If they can, this feature request is extended to prevent that as well. *We scienced this and apparently they are not refunded, unless you undo your own star. So that's good. It's possible in the case that provoked this request that there were multiple people involved or the one person beat the star-canceller to the punch, so the annoyance factor is still there to a degree. Here I interpret star spamming as starring every message so that meaningful stars are drowned out and do not appear on the starboard, or repeatedly starring and unstarring messages to create distraction and irritation for others. Anyone can star a message directly from the transcript page, without even being in the room. A person kicked from the room can continue to star messages while they are kicked. A person suspended from chat cannot star messages during their suspension. A person can create sock puppet accounts in order to star more than their daily limit, apply more than one star to a single message (including their own messages) or to get around a suspension of their main account. Currently, neither kicking nor suspending prevents a user from irritating the other users of a chatroom, due to the availability of sock puppet accounts. Sock puppets also allow a single user to create more disruption than would be practical from a single account. Other problems caused by sock puppets can be detected and dealt with, but starring is an exception. In most cases, there will be no indication of who is starring, so no one to kick or suspend anyway. However, anyone kicked or suspended for any other reason is free to use that time for undetectable star spamming. They are also free to do this in a different room than the one kicked from, so it will not necessarily be obvious that they are responsible. I feel this is already sufficient reason to take action, but I also have an unverified suspicion that people who are being actively irritated and who are unable to do anything about it are less likely to be nice to each other. So even amongst the non-disruptive users of a room, the atmosphere may deteriorate in the absence of a solution. Without being able to see which users starred a given message, there is no way to enforce a rule against star spamming. Even freezing the room or putting it into timeout doesn't prevent starring and unstarring, just prevents new messages coming in. Having to resort to this in the busiest of the chatrooms (which inevitably are more attractive to star spammers) causes inconvenience for a large number of people, without actually solving the problem. It also advertises the lack of power behind those tasked with keeping order (room owners and moderators). For some people this may encourage further disruptive behaviour. I propose that users or room owners call the attention of moderators using a moderator flag, and moderators be given access to view who starred a specific message. This then allows for dealing with any star spamming, whether by main accounts or sock puppets. This would need to include both who placed the current stars on a message, and who has previously starred then unstarred this message, since repeatedly starring and unstarring is also a big part of the problem, and will be undetectable after the event otherwise. Since I believe starring should be anonymous in order to encourage honest expression, I'd be very much in favour of this being treated as personal information, and the moderator access being recorded so that any moderator accessing this information beyond what is reasonably required can be detected. The only other alternatives seem to be to do nothing, or to try and automate a solution. I would expect an automated solution to still need some exception handling by a human, which would also require whoever does that handling to be able to see who starred a message. It seems to make more sense to introduce the ability for moderators to deal with this manually first, and then consider whether there is a need for automation later. Either this or rate-limit star/unstar actions in the same way chat messages are. I rarely need to star things once a second, every second. Increasingly long cooldowns for quick starring would also kill this problem. Not the answer you're looking for? 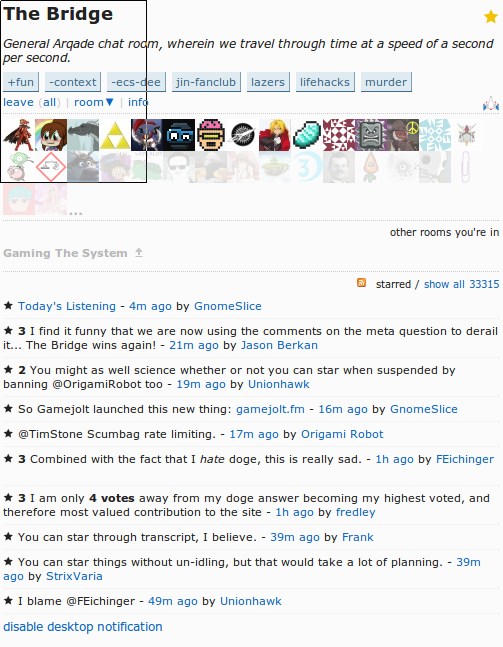 Browse other questions tagged feature-request chat moderator-tools abuse chat-stars . Stars and pins are retained when chat messages are moved! Which post on SE chat has the most stars?